For the second year in a row, Magneti Marelli is sponsoring the China Touring Car Championship (CTCC), the motorsport Chinese National Championship scheduled to kick off this upcoming Sunday, May 12th. Since 2012 Magneti Marelli and FASC (Federation of Automobile Sports of the People's Republic of China) – as the governing body of the championship – have been renewing a technical partnership that calls for Magneti Marelli Motorsport being the single supplier of the data acquisition system fitted on all racing cars. The data acquisition kit consists of an electronic control unit (Data Logger), a series of sensors installed on the engine and on the chassis of the cars and of a LED signal, which allow data to be collected for purposes of analysis and balancing of car performances, as well as control over compliance with the technical regulations. The data coming from the sensors is recorded and processed by the in-vehicle system, and is later downloaded from the cars at the end of the race and analyzed on a PC by the Wintax software in order to conduct the requested evaluations and analyses. Thanks to the data acquisition system supplied by Magneti Marelli Motorsport, FASC can ensure the teams a level of service and supervision that can be compared to the high standards of leading championships at the global level. With this technological collaboration, Magneti Marelli, a pioneer in telemetry systems and with over 90 years of experience in the world of motorsport competitions, lays the foundations for a deeper and deeper presence on the Chinese market, which does not stop at the racing world but also sees important implications in terms of mass-produced vehicles. The advanced telemetry solutions for the racing world provide reference methods and know-how also for applications to mass-production in info-telematic communication technologies between vehicles and infrastructures, with a view to a constant evolution towards new frontiers of efficiency, safety and reduced consumption. “Motorsport is passion, adrenalin and participation, but most importantly it is technological excellence and an ideal setting where to test, under extreme conditions, products and solutions that may have spin-offs also on mass-production” – stated Jack Cheng, Country Manager Magneti Marelli China. “For Magneti Marelli, China is a market of absolutely strategic importance, where the technological transfer from an excellence area such as the motorsport can provide know-how and experiences with high added value for road cars as well, within the context of a constantly growing market in terms of volumes and technological level”. 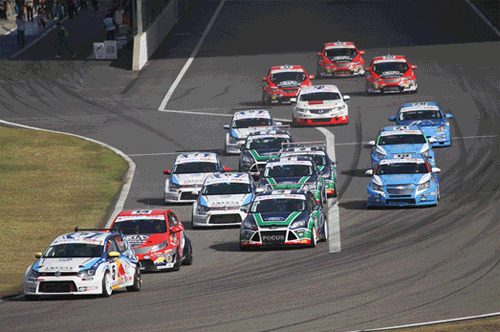 The China Touring Car Championship is followed by a large group of enthusiasts in China, and it is actually one of the most popular sports. The 2013 calendar features 9 events in which 10 teams will be battling out in three different classes: 2000cc N/A (Naturally Aspirated), 1600cc N/A and 1600cc Turbo. The season will kick off next Sunday 12th May at the International Circuit of Zhuhai, to then continue on the Shanghai international circuit. And it will be again Shanghai to host the 8th stage on November 3rd, together with the FIA World Touring Car Championship race. The Championship is scheduled to end on 17th November, for the 60th anniversary of the Macau Grand Prix.